Natural Latex mattresses are a terrific alternative if you suffer from back aches,pressure points, allergies, concerns about EMF's or if you live in an area where mold, mildew or dust mites are problems. Pure Natural Latex mattresses provide superior support and welcome relief from pressure points that may be causing aches and pains. Pure natural latex has the added benefit of providing increased circulation and support as it gently conforms to your body contours. 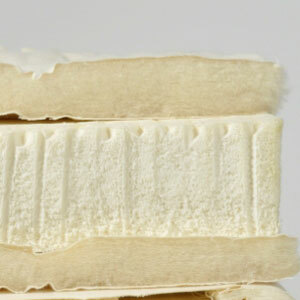 Hampton 7 100% Organic Latex Mattress. This pure, natural latex mattress offers a 6" core of GOL's certified Dunlop latex, quilted with pure organic cotton fabric filled with Eco-Wool. Choose the perfect firmness that suits you. Now available in soft, medium, medium firm, firm or x-firm. Hampton 10 100% Organic Latex Mattress. Featuring 2-layers of GOL's certified organic Dunlop latex. The 6" foundation layer is 100% organic Dunlop latex. Sitting on top of the 6" foundation is 2" of 100% GOL's certified organic Dunlop latex for a superior nights sleep. Carefully covered in a quilting of organic cotton and Eco-Wool, this is a superior quality hand-crafted two-layer mattress. 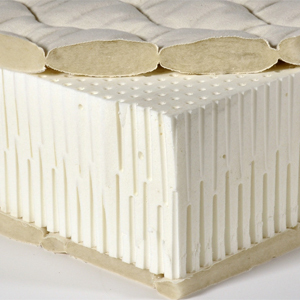 The 2" top layer can be substituted with 2" of 100% natural Talalay 2" latex. 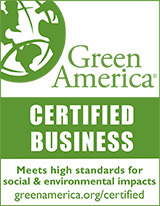 Hampton 12 100% Organic Latex Mattress. The Hampton 12 100% features 9" of plush GOL's certified organic latex. Starting with the 6" foundation made with your choice of medium, medium firm or firm 100% GOL's certified organic Dunlop latex. Sitting on top of the 6" foundation is 3" of GOL's certified organic Dunlop latex for a supreme night's sleep. Carefully covered in a plush knit quilting of organic cotton and of Eco-Wool. 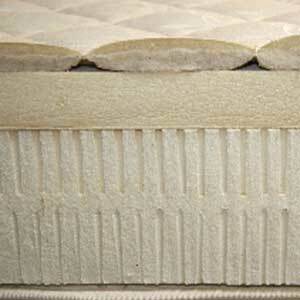 This mattress is our superior quality, hand-crafted organic latex mattress. 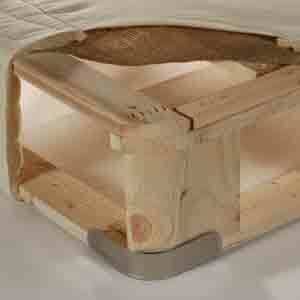 The top layer can be substituted with 3" of 100% natural Talalay 2" latex.